We've noticed that some of our new users haven't completed all the steps of foretaster's sign up process. They got stuck at the goal/conversion URL address - or put in layman's terms, the URL address on your website where your visitors become customers. Let's explain this on a well known service - Twitter. 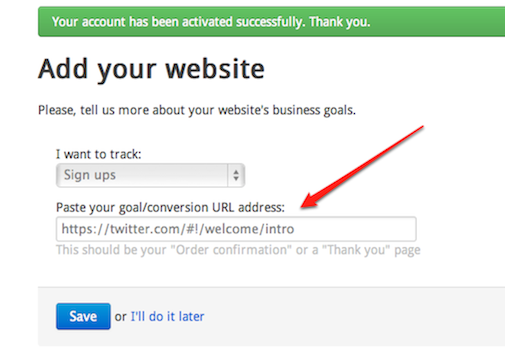 After you sign up for Twitter you are redirected to a "Welcome Page" which has an unique URL address. The only way you can end up on this URL is after you've signed up for Twitter. This (https://twitter.com/#!/welcome/intro) is the goal/conversion URL address you would enter into foretaster if you were from Twitter, Inc and wanted to track your sign ups using foretaster. If you still can't figure this out OR you need to use regular expressions, get in touch with us at hello@foretaster.com and we will see if we can help.